Born in Massachusetts, he was a Civil War veteran who was wounded three times in battle and who met President Abraham Lincoln on one of the President's visits to the front. He taught law at Harvard, sat on the Massachusetts Supreme Court for twenty years and served for thirty years on the United States Supreme Court, where he helped President Franklin D. Roosevelt select his own successor. An interesting fact is that he had ben appointed to the Court by President Theodore Roosevelt, who was disappointed in many of his decisions. He was known on the Court as "The Great Dissenter" because of the brilliant legal reasoning found in his written opinions. He retired from the Court on January 12, 1932 and was the oldest man to have ever served on the court. He died in Washington, D. C. on March 6, 1935 and was buried in Section 5 of Arlington National Cemetery. 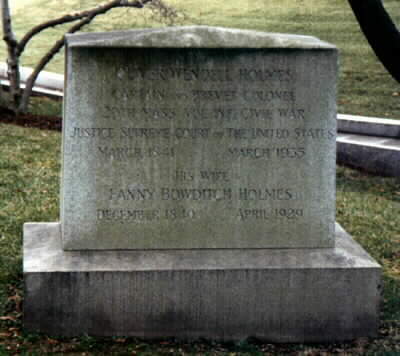 His wife, Fannie Bowditch Dixwell Holmes (December 1840-April 1929), whose burial was arranged by Chief Justice William Howard Taft because Holmes was too shy to ask for the honor, is buried with him. He is buried in Section 5 of Arlington National Cemetery, near the graves of fellow Supreme Court Justices William O. Douglas, Potter Stewart, Thurgood Marshall and William J. Brennan. "I have a lovely spot in Arlington toward the bottom of the hill where the house is, with pine trees, oak, and tulip all about, and where one looks to see a deer trot out (although of course there are no deer). I have ordered a stone of the form conventional for officers which will bear my name, Bvt. Col. and Capt. 20th Mass. Vol. Inf. Civil War- Justice Supreme Court, U.S.-March 1841- His wife Fanny Holmes and the dates. It seemed queer putting up my own tombstone-but these things are under military direction and I suppose it was necessary to show a soldiers' name to account for my wife". "I shall go out to Arlington tomorrow, Memorial Day, and visit the gravestone with my name and my wife's on it, and be stirred by the military music, and, instead of bothering about the Unknown Soldier shall go to another stone that tells beneath it are the bones of, I don't remember the number but two or three thousand and odd, once soldiers gathered from the Virginia fields after the Civil War. I heard a woman say there once, 'They gave their all. They gave their very names.' Later perhaps some people will come in to say goodbye." 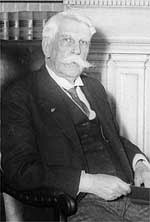 As Justice Holmes grew old he became a figure for legend. Eager young students of history and the law, with no possibility of an introduction to him, made pilgrimages to Washington merely that they might remember at least the sight of him on the bench of the Supreme Court. Others so fortunate as to be invited to his home were apt to consider themselves thereafter as men set apart. Their elders, far from discouraging this attitude, strengthened it. unmarred, unified by intelligent purpose and uninterrupted accomplishment, blessed by great talent employed in the worthiest activities, with a deserving fame never dimmed and always growing. Such a rarely beautiful life is that of Mr. Justice Holmes." He was born on March 8, 1841, in Boston. The cultural dominance of New England was at its height. The West was raw, great parts of it wilderness as yet only sketchily explored. A majority of the nation's citizens still considered the enslavement of Negroes as the operation of a law of God, and Darwin had not yet published his "Origin of Species." The circumstances of his birth were fortunate. His father, Dr. Oliver Wendell Holmes, was of New England's ruling caste and the atmosphere of his home was at once brahminical, scientific and literary. They boy was to start each day at that "autocratic" breakfast table where a bright saying won a child a second helping of marmalade. The boy was prepared for Harvard by E. S. Dixwell of Cambridge. He was fortunate again in this. Well-tutored, he made an excellent record in college. His intimacy with Mr. Dixwell's household was very close. His tutor's daughter, Fanny Dixwell, and he fell in love with each other and later they were married. Fort Sumter was fired on and President Lincoln called for 75,000 volunteers. Young Holmes, 20 years old and shortly to be graduated from Harvard with the class of '61, walked down Beacon Hill with an open Hobbe's "Leviathan" in his hand and learned that he was commissioned in the Twentieth Massachusetts Volunteers. The regiment, largely officered by young Harvard men and later to be known as the "Harvard Regiment," was ordered South and into action at Ball's Bluff. There were grave tactical errors and the Union troops were driven down the cliff on the Virginia shore and into the Potomac. Men trying to swim to safety were killed and wounded men were drowned. Lieutenant Holmes, with a bullet through his breast, was placed in a boat with dying men and ferried through saving darkness to the Maryland shore. His wound was serious, but the sufferer was young and storng. For convalescence he was returned to Boston. On his recovery he returned to the front. At Antietam a bullet pierced his neck and again his condition was critical. Dr. Holmes, on learning the news, set out to search for his son. The search lasted many worried days and brought the father close to the lines at several points. He found his son already convalescent and brought him back to Boston, where he wrote his experiences under the title, "My Hunt for the Captain," an article that was enthusiastically received as bringing home to Boston a first-hand picture of the trials of war directly behind the lines. Back at the front, the young officer was again wounded. A bullet cut through tendons and lodged in his heel. 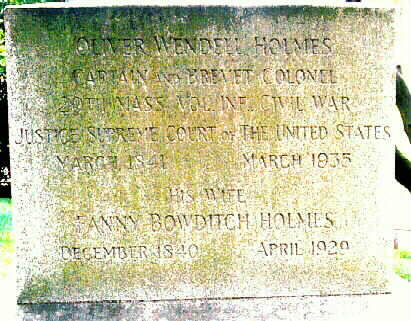 This wound was long in healing and Holmes was retired to Boston with the brevet ranks of Colonel and Major. The emergency of war over, his life was his own again. There was the question, then, of what to do with it. Writing appealed to him. He had been class poet and prize essayist in college. But he finally turned to law, although it was long before he was sure that he had taken the best course. "It cost me some years of doubt and unhappiness," he said later, "before I could say to myself: 'The law is part of the universe--if the universe can be thought about, one part must reveal it as much as another to one who can see that part. It is only a question if you have the eyes.'" Philosophy and William James helped him find his legal eyes while he studied in Harvard Law School and James, a year younger, was studying medicine. Through long nights they discussed their "dilapidated old friend the Kosmos." James later was to write in affectionate reminiscence of "your whitely lit-up room, drinking in your profound wisdom, your golden jibes, your costly imagery, listening to your shuddering laughter." But while James went on, continuing in Germany his search for the meanings of the universe, Holmes decided that "maybe the universe is too great a swell to have a meaning," that his task was to "make his own universe livable," and he drove deep into the study of the law. He took his LL. B. in 1866 and went to Europe to climb some mountains. Early in 1867 he was admitted to the bar and James noted that "Wendell is working too hard." The hard work brought results. In 1870 he was made editor of the American Law Review. Two years later, on June 17, 1872, he married Fanny Bowditch Dixwell and in March of the next year became a member of the law firm of Shattuck, Homes & Munroe, resigning his editorship but continuing to write articles for The Review. In that same year, 1873, his important edition of Kent's Commentaries appeared. His papers, particularly one on English equity, which bristled with citations in Latin and German, showed that he was a master scholar where mastery meant labor and penetration. It was into these early papers that he put the fundamentals of an exposition of the law that he was later to deliver in Lowell Lectures at Harvard and to publish under the title, "The Common Law." In this book, to quote Benjamin N. Cardozo, he "packed a whole philosophy of legal method into a fragment of a paragraph." "The life of the law has not been logic; it has been experience. The felt necessities of the time, the prevalent moral and political theories, intuitions of public policy avowed or unconscious, even with the prejudices which judges share with their follow-men, have had a great deal more to do than the syllogism in determining the rules by which men should be governed. The law embodies the story of a nation's development through many centuries, and it cannot be dealt with as if it contained only the axioms and corollaries of a book of mathematics." "The student of juristic method, bewildered in a maze of precedents, feels the thrill of a new apocalypse in the flash of this revealing insight. Here is the text to be unfolded. All that is to come will be development and commentary. Flashes there are like this in his earlier manner as in his latest, yet the flashes grow more frequent, the thunder peals more resonant, with the movement of the years." Holmes was only 39 years old when Harvard called him back to teach in her Law School and 41 when he became an Associate Justice on the Massachusetts Supreme Court bench. So in that great period when Joseph H. Choate could call a Federal income tax "sheer communism," the young Massachusetts justice could, with no bias, write dozens of dissenting opinions in which he expressed views that since have been molded into law. He was Chief Justice on the Commonwealth bench when, in 1901, Theodore Roosevelt noted that Holmes's "labor decisions" were criticized by "some of the big railroad men and other members of large corporations." Oddly enough the successor of William McKinley thought that was "a strong point in Judge Holmes's favor." "The ablest lawyers and greatest judges are men whose past has naturally brought them into close relationship with the wealthiest and most powerful clients and I am glad when I can find a judge who has been able to preserve his aloofness of mind so as to keep his broad humanity of feeling and his sympathy for the class from which he has not drawn clients." In further expression of this approval he in 1902 appointed Judge Holmes to the Supreme Court of the United States, an appointment that was confirmed by the Senate immediately and unanimously. In a dissenting opinion written early in his career on the Supreme bench Justice Holmes bluntly told his associates that the case in hand had been decided by the majority on an economic theory which a large part of the country did not entertain, that general principles do not decide concrete cases, that the outcome depends on a judgment or institution more subtle than any articulate major premise. A great struggle between the forces of Theodore Roosevelt and the elder J. P. Morgan began on March 10, 1902, when the government filed suit in the United States Circuit Court for the district of Minnesota charging that the Great Northern Securities Company was "a virtual consolidation of two competing transcontinental lines" whereby not only would "monopoly of the interstate and foreign commerce, formerly carried on by them as competitors, be created," but, through use of the same machinery, "the entire railway systems of the country may be absorbed, merged, and consolidated." In April, 1903, the lower court decided for the government and 8,000 pages of records and briefs went to the United States Supreme Court for final review. On March 14, 1904, the high court found for the government, with Justice Holmes writing in dissent. He held that the Sherman act did not prescribe the rule of "free competition among those engaged in interstate commerce," as the majority held. It merely forbade "restraint of trade or commerce." He asserted that the phrases "restraint of competition" and "restraint of trade" did not have the same meaning; that "restraint of trade," which had "a definite and well-established significance in the common law, means and had always been understand to mean, a combination made by men engaged in a certain business for the purpose of keeping other men out of that business." The objection to trusts was not the union of former competitors, but the sinister power exercised, or supposed to be exercised, by the combination in keeping rivals out of the business, he said. It was the ferocious extreme of competition with others, not the cessation of competition among the partners, which was the evil feared. "Much trouble," he continued, "is made by substituting other phrases, assumed to be equivalent, which are then argued from as if they were in the act. The court below argued as if maintaining competition were the express purpose of the act. The act says nothing about competition." It was at this time that John Morley visited America and returned to England with the affirmation that in Justice Homes America possessed the greatest judge of the English-speaking world. Time has reinforced the emphasis. In his years on the Supreme Court bench he had done more to mold the texture of the Constitution than any man since John Marshall revealed to the American people what their new Constitution might imply. Matthew Arnold, in his essay on the study of poetry, says that the best way to separate the gold from the alloy in the coinage of the poets is by the test of a few lines carried in the thoughts. "When men have realized that time has upset many fighting faiths, they may come to believe even more than they believe the very foundations of their own conduct that the ultimate good desired is better reached by free trade in ideas -- that the best test of truth is the power of the thought to get itself accepted in the competition of the market, and that truth is the only ground upon which their wishes can be carried out. That, at any rate, is the theory of our Constitution. It is an experiment, as all life is an experiment." "In the organic relations of modern society it may sometimes be hard to draw the line that is supposed to limit the authority of the Legislature to exercise or delegate the power of eminent domain. But to gather the streams from waste and to draw from them energy, labor without brains, and so to save mankind from toil that it can be spared, is to supply what, next to intellect, is the very foundation of all our achievements and all our welfare. If that purpose is not public, we should be at a loss to say what is." "The Fourteenth Amendment does not enact Mr. Herbert Spencer's social tatics." "While the courts must exercise a judgment of their own, it by no means is true that every law is void which may seem to the judges who pass upon it, excessive, unsuited to its ostensible end, or based upon conceptions of morality with which they disagree. Considerable latitude must be allowed for difference of view as well as for possible peculiar conditions which this court can know but imperfectly, if at all. Otherwise a Constitution, instead of embodying only relatively fundamental rules of right, as generally understood by all English-speaking communities, would become the partisan of a particular set of ethical or economic opinions, which by no means are held semper ubique et ab omnibus." His contribution to American life was not limited to the law. He lived as he advised others to live, in the "grand manner." He sought quality rather than quantity of experience and knowledge of his success in living helped others to find it, too. On his ninetieth birthday he delivered a short radio speech in reply to tributes from Chief Justice Hughes and other leaders of the American bar. "Death plucks my ears and says, 'Live -- I am coming.'" "To live is to function; that is all there is to living." Justice Holmes resigned on January 12, 1932. "The time has now come and I bow to the inevitable," he wrote to the President. He left, amid national regret, almost thirty years after he had been appointed to the Supreme Court bench. "I cannot say farewell to life and you in formal words. Life seems to me like a Japanese picture which our imagination does not allow to end with the margin. We aim at the infinite, and when our arrow falls to earth it is in flames. "At times the ambitious ends of life have made it seem to me lonely, but it has not been. You have given me the companionship of dear friends who have helped to keep alive the fire in my heart. If I could think that I had sent a spark to those who come after, I should be ready to say good-bye." Justice Holmes was an honorary member of the Honourable Society of Lincoln's Inn, London, to which also belonged such men as Oliver Cromwell, William Pitt, Benjamin Disraeli and William Ewart Gladstone. Soon after retiring, his salary was cut in two by reason of the economy law. It was restored to $20,000 a year a few months later, however, by special action of the Senate. In the Fall of 1931 appeared the "Representative Opinions of Mr. Justice Holmes." 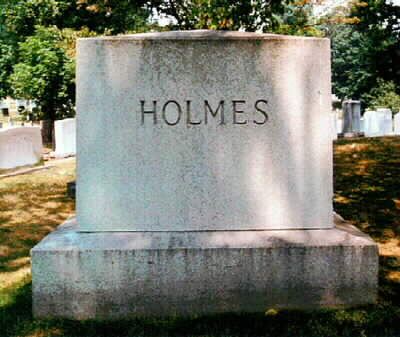 Mrs. Holmes died on April 30, 1929. 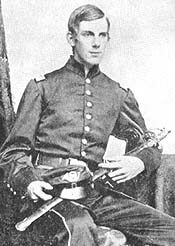 Oliver Wendell Holmes, Jr. "In Our Youth Our Hearts Were Touched With Fire"
An address delivered for Memorial Day, May 30, 1884, at Keene, New Hampshire, before John Sedgwick Post No. 4, Grand Army of the Republic. There is one who on this day is always present on my mind. [Web note: Henry Abbott, 20th Mass.] He entered the army at nineteen, a second lieutenant. In the Wilderness, already at the head of his regiment, he fell, using the moment that was left him of life to give all of his little fortune to his soldiers.I saw him in camp, on the march, in action. I crossed debatable land with him when we were rejoining the Army together. I observed him in every kind of duty, and never in all the time I knew him did I see him fail to choose that alternative of conduct which was most disagreeable to himself. He was indeed a Puritan in all his virtues, without the Puritan austerity; for, when duty was at an end, he who had been the master and leader became the chosen companion in every pleasure that a man might honestly enjoy. His few surviving companions will never forget the awful spectacle of his advance alone with his company in the streets of redericksburg. [Web note: The legendary suicidal charge of the 20th Mass. Regiment occurred on Dec. 11, 1862.] In less than sixty seconds he would become the focus of a hidden and annihilating fire from a semicircle of houses. His first platoon had vanished under it in an instant, ten men falling dead by his side. He had quietly turned back to where the other half of his company was waiting, had given the order, "Second Platoon, forward!" and was again moving on, in obedience to superior command, to certain and useless death, when the order he was obeying was countermanded. The end was distant only a few seconds; but if you had seen him with his indifferent carriage, and sword swinging from his finger like a cane, you would never have suspected that he was doing more than conducting a company drill on the camp parade ground. He was little more than a boy, but the grizzled corps commanders knew and admired him; and for us, who not only admired, but loved, his death seemed to end a portion of our life also. Such hearts--ah me, how many!--were stilled twenty years ago; and to us who remain behind is left this day of memories. Every year--in the full tide of spring, at the height of the symphony of flowers and love and life--there comes a pause, and through the silence we hear the lonely pipe of death. Year after year lovers wandering under the apple trees and through the clover and deep grass are surprised with sudden tears as they see black veiled figures stealing through the morning to a soldier's grave. Year after year the comrades of the dead follow, with public honor, procession and commemorative flags and funeral march -- honor and grief from us who stand almost alone, and have seen the best and noblest of our generation pass away. An Address Delivered on Memorial Day, May 30, 1895, at a Meeting Called by the Graduating Class of Harvard University. President Theodore Roosevelt's admiration for this speech was a factor in Holmes' nomination to the US Supreme Court. The most quoted line of this speech is "We have shared the incommunicable experience of war; we have felt, we still feel, the passion of life to its top." s Justice Holmes grew old he became a figure for legend. Eager young students of history and the law, with no possibility of an introduction to him, made pilgrimages to Washington merely that they might remember at least the sight of him on the bench of the Supreme Court. Others so fortunate as to be invited to his home were apt to consider themselves thereafter as men set apart. Their elders, far from discouraging this attitude, strengthened it. "The most beautiful and the rarest thing in the world is a complete human life, unmarred, unified by intelligent purpose and uninterrupted accomplishment, blessed by great talent employed in the worthiest activities, with a deserving fame never dimmed and always growing. Such a rarely beautiful life is that of Mr. Justice Holmes." He held that the Sherman act did not prescribe the rule of "free competition among those engaged in interstate commerce," as the majority held. It merely forbade "restraint of trade or commerce." He asserted that the phrases "restraint of competition" and "restraint of trade" did not have the same meaning; that "restraint of trade," which had "a definite and well-established significance in the common law, means and had always been understand to mean, a combination made by men engaged in a certain business for the purpose of keeping other men out of that business * * *." It was at this time that John Morley visited America and returned to England with the affirmation that in Justice Homes America possessed the greatest judge of the English- speaking world. Time has reinforced the emphasis. In his years on the Supreme Court bench he had done more to mold the texture of the Constitution than any man since John Marshall revealed to the American people what their new Constitution might imply. "When men have realized that time has upset many fighting faiths, they may come to believe even more than they believe the very foundations of their own conduct that the ultimate good desired is better reached by free trade in ideas--that the best test of truth is the power of the thought to get itself accepted in the competition of the market, and that truth is the only ground upon which their wishes can be carried out. That, at any rate, is the theory of our Constitution. It is an experiment, as all life is an experiment." "The Fourteenth Amendment does not enact Mr. Herbert Spencer's social statics." "Death plucks my ears and says, 'Live--I am coming.'" Justice Holmes resigned on Jan. 12, 1932. "The time has now come and I bow to the inevitable," he wrote to the President. He left, amid national regret, almost thirty years after he had been appointed to the Supreme Court bench.